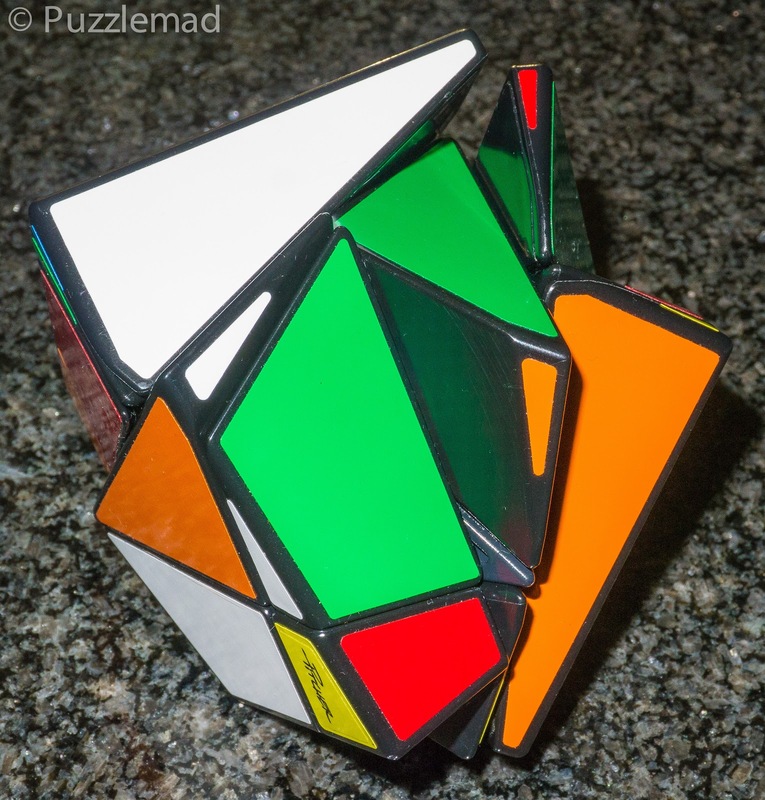 PuzzleMad: Win some, lose some, come close.....but fail again! Win some, lose some, come close.....but fail again! A puzzle for my birthday? Nope! She even made me work when it arrived! 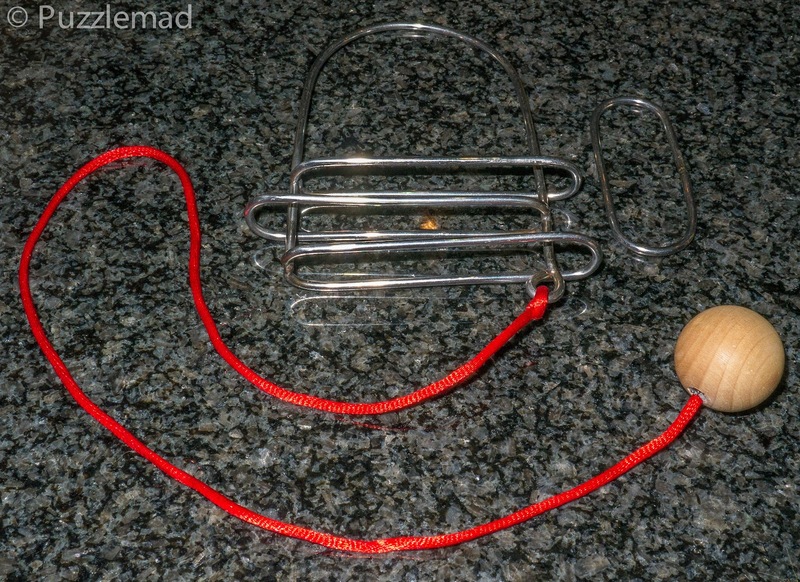 Now if you hear lots of groaning sounds whilst reading this post you must blame the present wife! Mrs S was all very nice to me on my birthday on Friday and even bought me a very nice present (a Kindle Paperwhite and NOT puzzles). The following day it was all back to normal service again - she saw that the weather forecast for Sheffield was good for Saturday (and supposed to be bad for Sunday) and pronounced that it was time for us (me) to do the end of year gardening chores. I did protest that I had a new puzzle to play with that arrived that very morning but she glared at me until my skin began to peel off and I dutifully did as I was told. I absolutely loathe gardening! Many would say that as a very short man, I am very close to the ground and bending down to pick up fallen leaves and pull weeds should be very easy for me! Unfortunately, whilst it is true that I am very close to the ground, it is also true that my recent birthday makes me VERY old and bending down a lot and doing thousands of squats in one day is not good for someone so old! After 7 hours of it on Saturday I was ready to hide away from the "trick or treaters" with all the lights off and drink wine for the rest of the evening and play with my new toy! Then this morning she sprung out of bed, saw that it was a beautiful day out and pronounced that I had more to do in the garden - time to scrub the patio and paths with bio washing powder to get rid of the algae. Does she not realise that Sunday is a day of rest, writing and puzzling? I moved a few muscles and realised that they hurt quite a lot but that would be no excuse. So I have been scrubbing for 4 hours today and am starting to seize up. If this blog post doesn't end then I am fixed in an agonising position in front of my computer....... please come and rescue me quick! 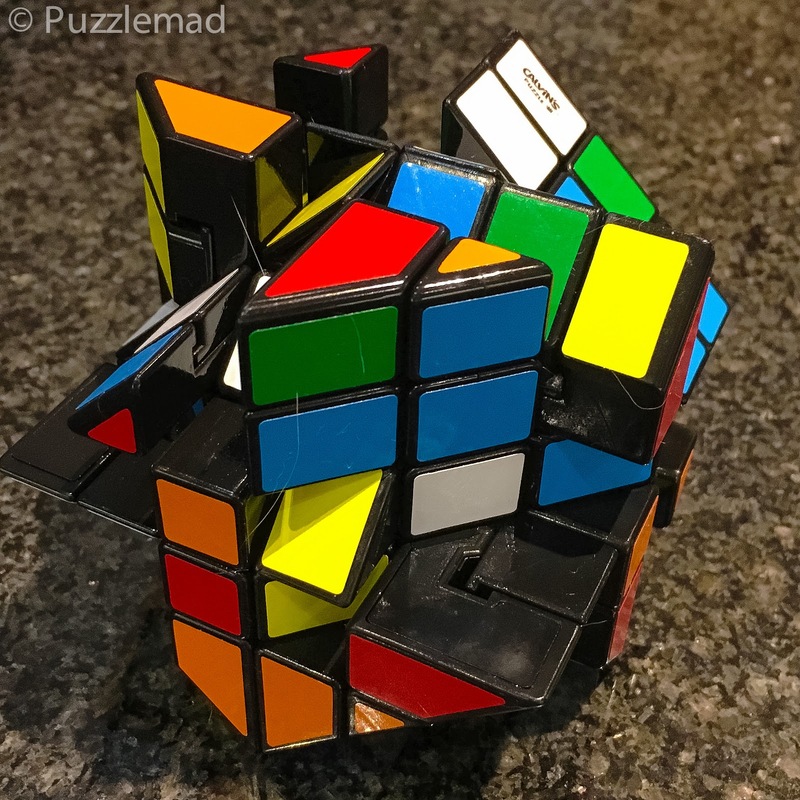 The topic for today is a mish mash of what happens after you get out of the habit of puzzling (or doing a particular genre) for a while and then start again. 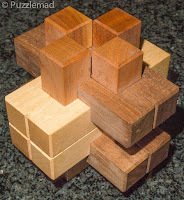 Recently after my bereavement, I pretty much stopped puzzling for a while because I had lost my mojo. Once my concentration had begun to return, I started to play again but with mixed success. A great friend had seen that my Wausau collection was still incomplete and as a wonderful surprise he gifted the remaining 2 to me. Of course I couldn't resist going straight for them and whilst at work I had a quick play. 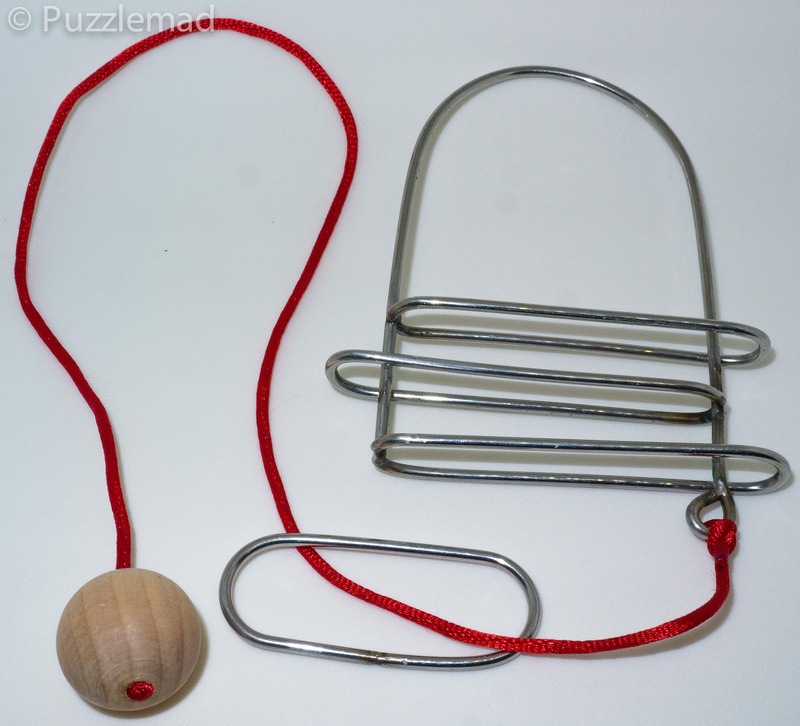 It had been 2011 when I last wrote about these puzzles from Bill Cutler - they were pretty much the first burrs I had ever tried. I was very pleased with learning a new technique and experiencing a new puzzle type at the time and since then I have worked very hard on bankrupting myself buying more lovely burrs. 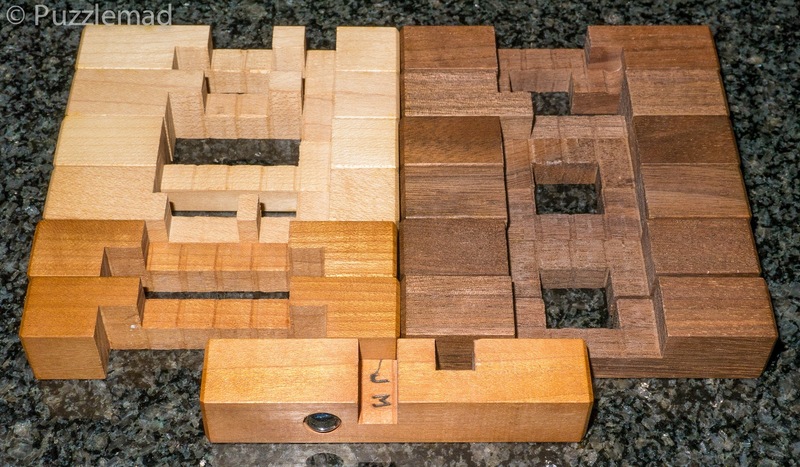 I spent about 45 minutes playing with this and getting nowhere before I headed off to Bill's site and reading the blurb on the Wausau 81 and 82 puzzles. 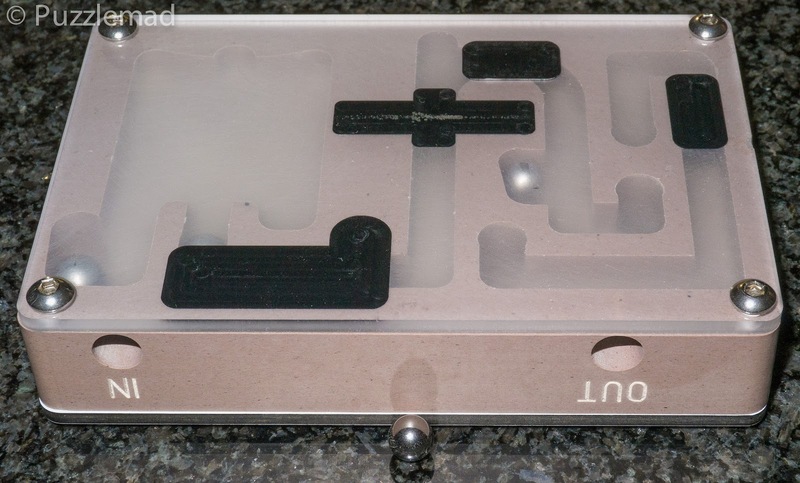 One of them mentions the need to use lock-picking techniques and at that point I changed my approach to solving it. I have no experience of picking locks but I understand the basic ideas and after another 10 minutes or so my A-ha! moment arrived. 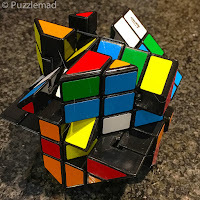 Very clever idea and interestingly, it is just as much fun to reassemble from the scrambled pieces - it is actually a very logical reassembly. Flushed with my success, the following day I moved onto the next in the series - Wausau 82. 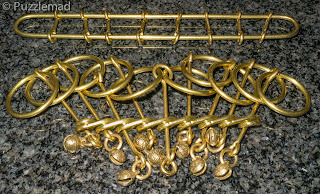 This time a totally different shape and more pieces to play with - this time I was expecting to have to use the same technique as before and only needed to work out which pieces to use. This one had an even better A-ha! moment. 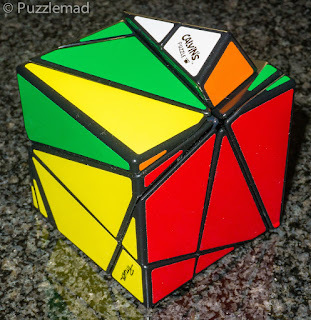 It really scared me though when I scrambled the pieces and almost couldn't work out how to put it back together again. It went together most of the way but the final piece wouldn't go in. Luckily I did recall the exact sequence required for disassembly and could look at the gaps I had left and see why it wasn't working - a quick flip over of a piece and I was in business again. This pair makes a great pair of worry beads and they haven't yet been put into the collection because I i) don't have the space to fit them in and ii) enjoy playing with them. Eventually when the study turns into a shithole again I will be "forced" to put them away. 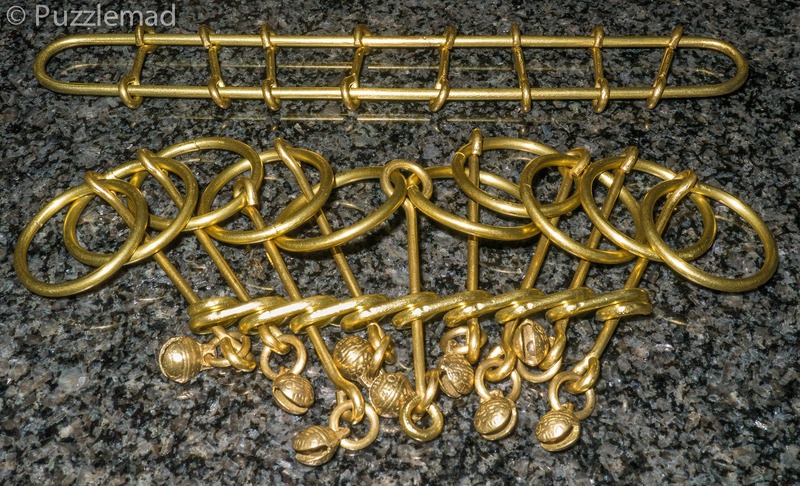 My last post in which I described my trials and tribulations - described how I had eventually solved one of the variants of James Dalgety's Ball and Chain puzzle. The one I was successful with first had 2 layers. The 3 layer variant had been taunting me for a month and I had more or less stopped trying because the knots were truly horrific. Eventually I could stand the humiliation no longer and I went for it systematically. Thankfully, it is possible to undo the knot attaching the rather long piece of string to the wire and reset it manually (OK by cheating). After an hour or so of systematic attempts, I finally had a solution which is almost repeatable every time I try. Thank goodness for that. This is another stunner by Mr Wang Yulong and I hope to get some more sometime soon. 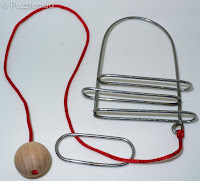 These wire and string puzzles always give a small clue - the string that is included is usually just long enough to allow you to do what is necessary and no more! 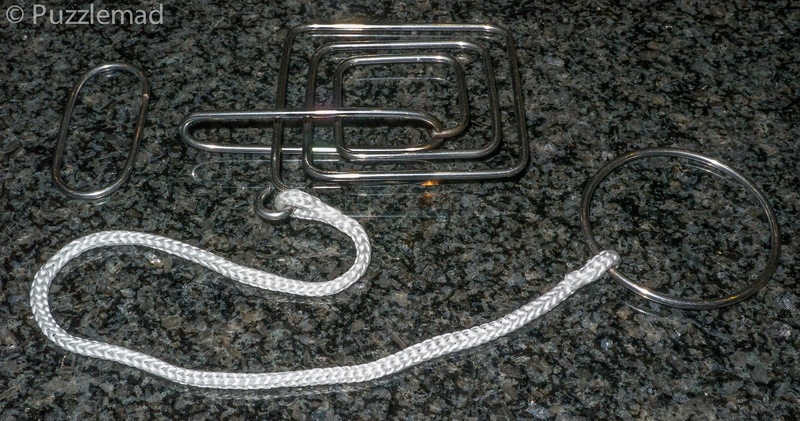 The fact that this one has a huge length of string is a warning to all potential puzzlers that it is going to be rather complex and with a very high risk of complex knots! At last it can no longer taunt me - another win! Another winner for me (which amazed one of my junior trainees at work) was the 2 way Chinese rings. This was designed by Mr. Wu Jianjiang and sent to me from China. I had seen a version (made by Jan Sturm) of this some years ago which was being sold by Wil Strijbos but never got around to buying it. When this was made available to me I jumped at the chance. 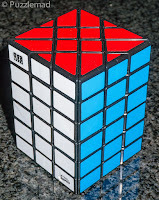 It arrived here having been extensively played with by the members of the Taiwanese puzzle society. 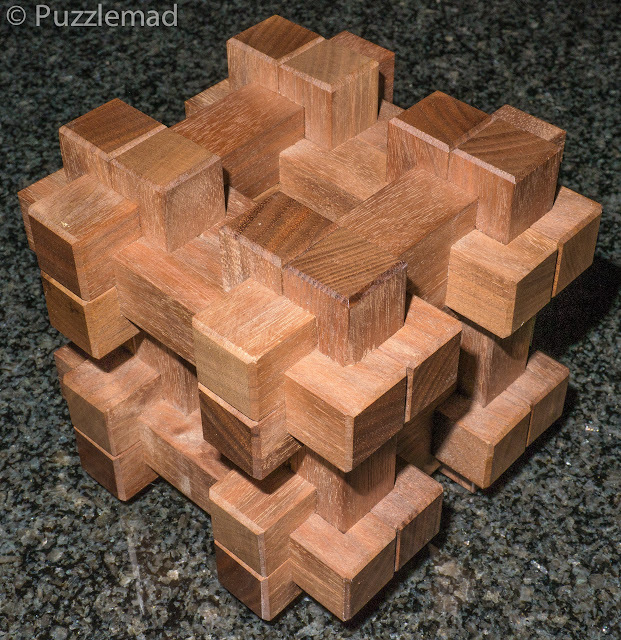 I was surprised to hear that none of those illustrious puzzlers had managed to fathom out the solution. After a jingly evening during which Mrs S burnt me badly with the laser burning stare, I could see why the puzzlers in Taiwan had struggled. The original Chinese rings and the Right left version from Jan/Wil are, according to the world's leading expert (Goetz Schwandtner), binary in nature and are more fun than confusing. The version sent to me here was made MUCH more complex by the addition of crossbars on the shuttle piece. 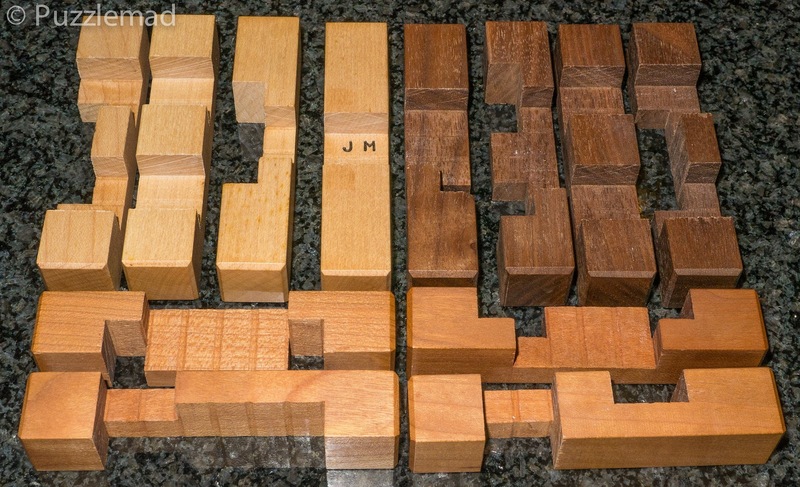 These really get in the way and I think turn the puzzle into a ternary version. Unfortunately I have no idea how you can tell the "N-ary-ness" of a puzzle - maybe Goetz will chime in by email or in the comments. Solved it - see the twist? 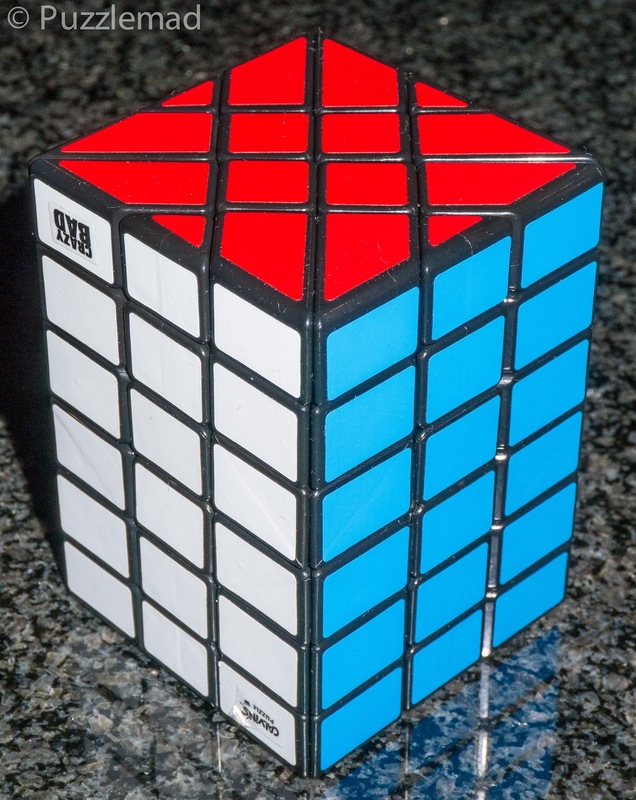 I have been playing with it on and off for a month and really getting nowhere apart from discovering the first few moves and then getting burnt again. Finally I decided that enough was enough and it had to come to work with me for truly safe solving. Half way through an operation, I had my A-ha! moment and a blinding fast sequence of moves which stunned my trainee left me with half the puzzle solved. I swivelled it around and to prove that I was a genius and knew what I was doing, I did the other side even more rapidly. The shuttle separated and the surgeon congratulated me and then went back to his spinal operation - the whole operating theatre was impressed with my prowess! This makes a change as they usually think I'm some kind of crazy person! So those are puzzles I managed to beat - yes I actually won some! But recently I seem to have struggled quite badly! Have I lost my mojo? Am I biting off more than I can chew? 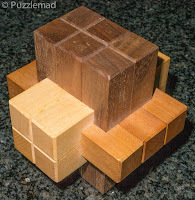 Or are there some puzzles that are just too hard for me to solve? The Aftersound puzzle from Mr Wang Yulong was an example of a truly beautiful puzzle which I had failed at and even needed to resort to a pair of pliers to reset. 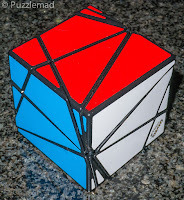 After a message from a friend who has played with it, I received a pdf solution and can now admit somewhat ashamedly that the solution is nowhere near as difficult as I thought! Yep! This one is definitely a lose - "must do better"! Aftersound finally solved - it's not even particularly hard but I definitely failed! Another beauty I received in the same gift package as the Wausau pair is the S/M 24 designed by Bill Cutler in 1987 and made beautifully by Jerry McFarland from Walnut. It is a notched 24 piece burr with all the notches hidden and and no internal holes. 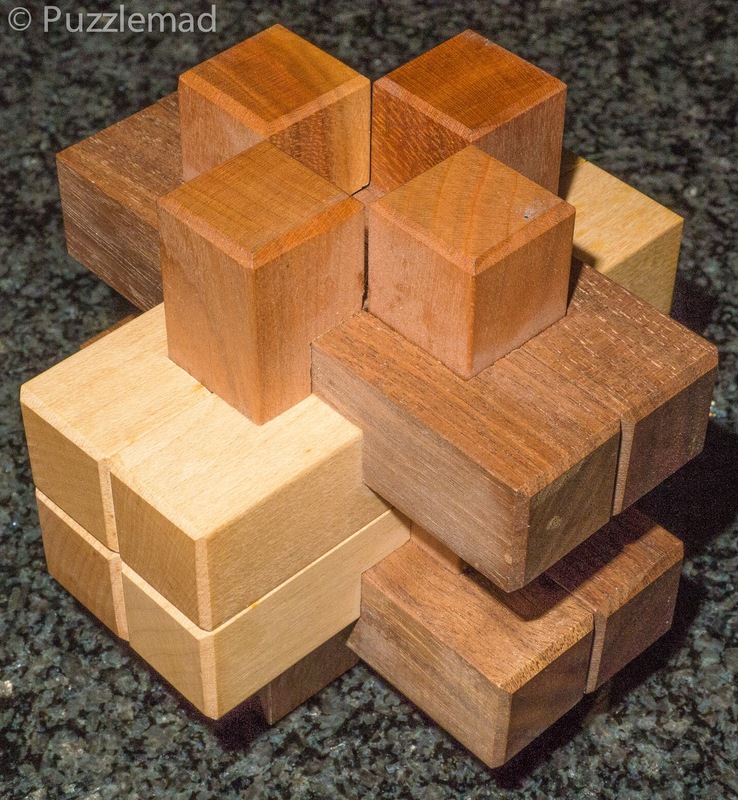 It "only" requires 7 moves to remove the first piece but each move requires the movement of many pieces. I've been working on this for for 2 weeks and only found the first 2 moves! So far this is a lose - and definitely "must do better" - that's the story of my life! Just a shape mod of a cuboid! Maybe not JUST a shapemod? I have no idea how to fix it - but I will keep working on it and still probably fail. At least my backlog is starting to be cleared and I will be able to justify buying some more. Who am I kidding? I never need to justify it - just hide them when they arrive! Glad to see you back and in fine form as usual. Cheers.